The Lake Rhona trail is fascinating 2 day, 28km trail hike located within the Wild Rivers National Park. Nestled in the midst of the Denison Ranges, the Lake’s beautiful white quartize sands stand in stark contrast to the dominate ridges which surround it, making it a truly unique sight. The trail follows flat buttongrass marshland for a majority of the distance before an abrupt but relatively short climb of 400m in the final section below the Lake. View Google Map Directions From Hobart, head north-west on the Brooker Highway (A10) to New Norfolk. Once at New Norfolk, follow the winding road of B61/B62, passing Mt Field and Maydena. 2km west of Maydena turn right onto Florentine Road (signposted Styx Valley). Follow this gravel road for 27km before forking left on to Tiger Road. 3.5km later turn left onto Range Road, following it for another 3.5km before turning left again onto Terry Walch Road. Follow Terry Walch Road for 3km before taking the G03 spur to the right. The car park for Lake Rhona is located 200m down this road. * Note the Google maps link does not reach the trailhead. Having made your way through the rabbit warren of roads leading to the Florentine State Forest’s trailhead the trail heads directly into the Gordon Range. The first point of interest after filling out the walkers’ logbook is the Gordon River 40 minutes away. This initial section of the trail gently meanders downhill towards the River and would be suitable as a short day hike. 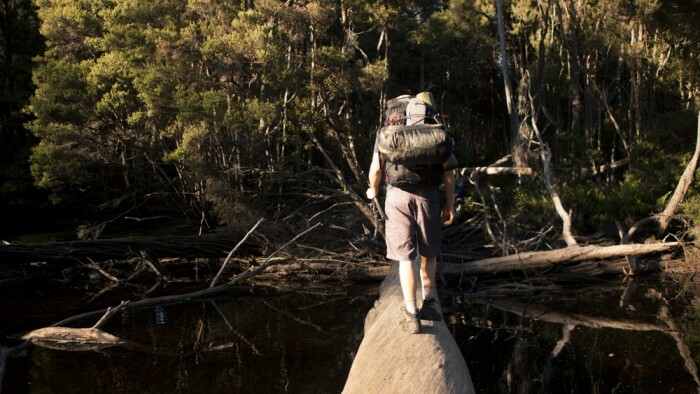 At the Gordon River a large fallen tree kindly provides a sturdy log bridge. Alternatively, the river can be waded slightly upstream. Please note however that the Gordon River’s water level can rise dramatically after heavy rain and walkers have become stuck in the past. A lovely campsite is also situated here, nestled in the Myrtle forest on the other side. Heading north along the Rasselas Track for the next 3km the trail alternates between muddy button grass marshland and dry sclerophyll forest before entering Gordonvale, the site of the once thriving homestead of Ernie Bond. For over 17 years between the 1930’s and 1950’s, Bond lived at Gordonvale, offering his renowned hospitality to all visitors. Very little remains now of the multitude of buildings which once were present here. Over the course of the next 4km the trail gradually climbs. From Gordonvale the trail returns to the marsh plains, crossing many small creeks and sections of heavy mud. As you make your way along this lower sections of Denisons Ranges, Reids Peak, directly above our destination can be viewed out to west. The final section of the hike, a few hours from Gordonvale, is by far the most strenuous of the trail. Following the ridgelines of Denisons Range, the trail climbs 400m over only a few kilometres and many fake apexes are encountered. As you climb however, brilliant views back towards Gordon Range highlight the intricate system of waterways within the Vale of Rasselas. The last ridge is by far the steepest and most walkers will be quite exhausted having reached this point. As you ascend the final ridge shrouding Lake Rhona you are hit by the peculiar beauty of your surroundings. It’s a surreal place. The juxtaposition of towering coarse cliffs and the timid inviting waters of the lake is enough to leave most hikers awe struck. From here the lake is easily skirted to the camp grounds, positioned over the dunes from the beach. The total days walking distance is 14km and should take between 5 and 7 hours. Returning to the trailhead along the same route is 1 or 2 hours quicker thanks to the downhill incline. From Lake Rhona walkers are thoroughly encouraged to make the most of their surroundings by doing the 6km circuit walk around the ridges above the Lake. Starting from the hill opposite the beach, the trail takes in Great Dome and Reids Peak and offers fantastic views down onto the Lake and beyond. This trail should only be attempted in clear weather as cloud coverage can easily fog the trail towards Reids Peak. 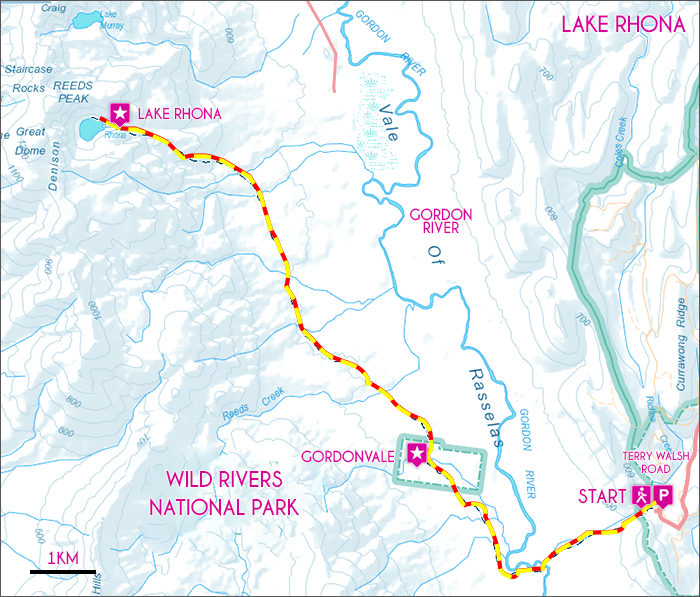 This loop can takes roughly 4 hours to complete and is recommended when doing the Lake Rhona walk as a 3 day trek. 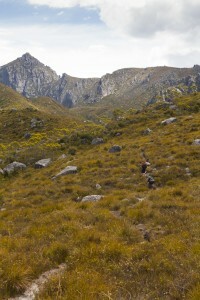 As with all wilderness walks in Tasmania, weather can change both dramatically and quickly. Similarly, the water levels in the Gordon River can rise significantly after heavy rain. Walkers must be conscience of this and pack appropriate clothing and provisions in case of emergencies. Temperatures can drop dramatically with little warning. Winds can also get up to incredible speeds on the ridges above Lake Rhona, be sure to take care when approaching cliff edges.